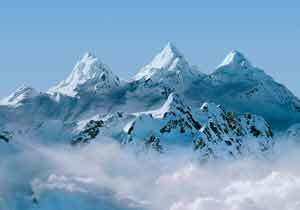 The Alps are the highest mountain chain system in the Europe continent. The Alps mountains stretch from Austria and Slovenia in the east through Switzerland, Italy and in the west from Germany to France. Its range starts nigh to the Mediterranean Sea that is on the border between Italy and France. It curves north and eastward through Southern Germany, Austria, and Northern Italy. The Alps are about 1000 km in length and 260 km in width. The Mont Blanc otherwise called White Mountain is the highest peak situated on the border between Italy, France, and Switzerland and rises 4807 meters above the sea level. Monte Rosa, the Matterhorn, the Zugspitze are the other famous peaks. 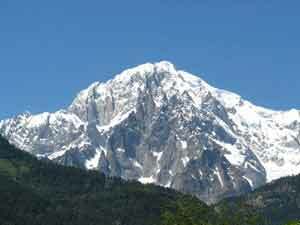 It is the tallest mountain in the Alps that attracts many visitors. The Alps is a popular tourist place in Europe. Tourists visit the place all round the year for various reasons. Generally higher areas are colder than the valleys along with more rainfall, snow. Sometimes warm dry winds blow downward along with mountain sides. The air starts from the Mediterranean area, climbs over the Southern Alps where it loses its moisture and turns dry and warm melts down the ice and snow. This condition leads to raising the temperature up to 20 Â°C in the colder valleys. Few people in the early era attempted to climb the Alps. During the mid of the 1800s, many people climbed alpine peaks. Today, there are many guides use advanced equipment and help the people to reach the highest peak. Every year more than 2000 alpinists climb to the Matterhorn top point which is one of the most difficult mountains to climb. Approximately 120 million visitors visit every year and fourteen million people have been living in Alps region. Grenoble has been called as the capital city of Alps; it is the biggest city in the Alps. Around 500,000 people have been dwelling in Grenoble. During World War I around 40,000 to 80,000 men died due to avalanches in the Alps. Spring seasons starts around April when the snow starts to melt. This is an amazing time of year as the first flowers come out, the hibernating animals wake up and the rivers are full of rapid water flow. April to June is a season for cyclists, mountain bikers, and white water sports lovers. In September and October, the days will be warm and evenings will be cool. This season is the best for walking, road biking, climbing. During the late October the weather becomes cooler and November onwards the first snowfall drops. The snow falling starts from November to December and by mid December most of the ski resorts will be opened. 7th February to 7th March is the peak time in the Alps due to French school vacation. March is the favorable time for skiing and ski touring with sunny days. Most of the ski resorts close from the end of March to April end. It is a part of the Alps family and listed among the five best things to see in the Alps by the UNESCO World heritage site. The best places to see in Italian Alps are Cortina dâ€™Ampezzo, Trauttmansdorff Castle Gardens, Strada Della Forra, Villa del Balbianello and Lago Maggiore. The Swiss Alps extended from the western Alps to the eastern Alps. It encompasses an area sometimes called the Central Alps. It comprises of highest mountains of the Alps such as Dufourspitze, Dom, Matterhorn, and Liskamm. The most attractive places here are Bernina Express, Monte San Salvatore, Sphinx Observatory, the Matterhorn. This is a stunning attraction in the world out of its best scenery in Europe. Many sites seeing places from waterfall to forests are enjoyable. The best five in French Alps are Chamonix, Chambery, Route Napoleon, Annecy and Cirque du Fer-a-Cheval. Other than the Alps chains, there are some attractive sites seeing places say, Lake Como, Bellagio and Lugano (from Milan), Into the Alps (from Lucerne), Swiss Alps 2 Day Hiking Tour (from Lucerne), Annecy Day Trip (from Geneva). There are many chalets, boutique and luxurious hotels, inexpensive private rooms, cozy guesthouses, traditional inns are available around Alps Mountain. When you trip to Switzerland, do not lose an opportunity to visit The Alps.